Published by Ultima Architect Inc.
Reversi is a very challenging board game for all ages. The rules of Reversi are much simpler than any other board games. However, easy to learn doesn't mean easy to play well. It offers so many strategic possibilities, that you can spend the rest of your life to master it. Ultima Reversi is an implementation of Reversi, having many great features to customize the game and make it more interesting. 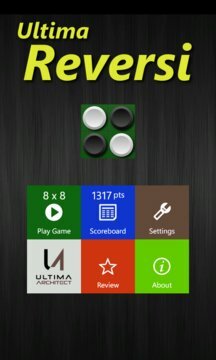 Challenge your strategic skills with Ultima Reversi! * The game begins with each player having two discs on a board. * The players alternate turns, each adding an additional disc on the board. * A valid move must capture at least one of the opponent's discs. This is done by surrounding it, either vertically, horizontally, or diagonally (or a combination of all three). When this occurs, the opponent's discs that you have surround become yours. * If one player cannot make a valid move, the player must pass and the other player plays again. * The game is over when the entire board is filled or when no side can make a valid move. * The winner of the game is the one with the most discs when the game is over. 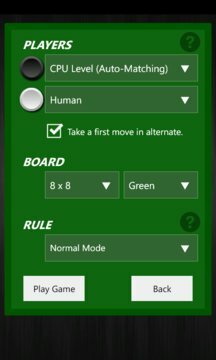 NOTES: Ultima Reversi has an "Auto Pass" feature that automatically passes your turn if you have no other move available and must pass.